CIT School of Humanities and CIT Arts Office are launching a series of events beginning at 7pm Wednesday, 13 February, Rory Gallagher Theatre, CIT Bishopstown Campus. 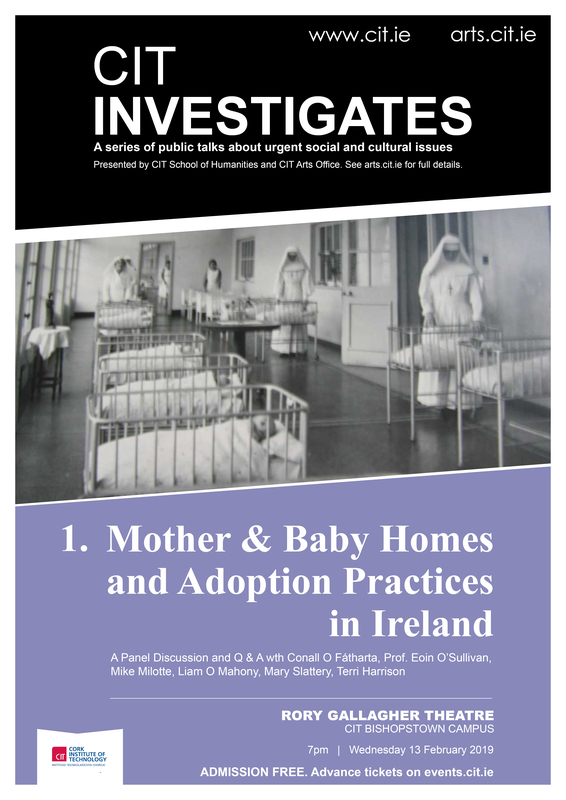 The first event will focus on Mother and Baby Homes/Adoption Practices in ireland, followed by a Q&A session. Conall Ó Fátharta, Prof. Eoin O’Sullivan, Mike Milotte, Liam O’Mahony, Mary Slattery, and Terri Harrison. ***UPDATE: ADVANCE ONLINE BOOKING FOR THIS EVENT IS SOLD-OUT*** A small number of seats may become available on the night, and will be allocated to a waiting list. The word ‘disappeared’ is another word that we associate with the recent conflict in the north. Over the thirty years of conflict, a total of 16 people ‘disappeared’. In 2014, an international outcry forced this state to acknowledge the research of Catherine Corless into infant deaths at a Tuam Mother and Baby Home, where the bodies of 796 babies and infants were left inside a sceptic tank. Knowledge and research about abnormally high infant mortality rates in Mother and Baby Homes throughout this state had been ignored, prior to the Tuam revelations by official Ireland. So-called ‘Angel Plots’ are sites were babies/infants within this state were ‘disappeared’. We still don’t know the number of people who ‘disappeared’ within this state.There is further evidence around non-consensual and unethical vaccination experiments that were carried out on so-called ‘illegitimate’ babies’. More research indicates how educational departments carried out non-consensual dissections of dead babies within our universities. ‘Consent’ is a word that needs to be critically examined when we look at Ireland’s secretive adoption system which deprived women of their right to motherhood. The forced separation of a baby from his/her mother is an unnatural and traumatising event. The loss of an identity is an another additional trauma that adoptees have had to live with. 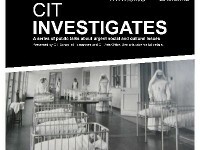 Under the title "CIT INVESTIGATES", Cork Institute of Technology is running a series of events with the intention of highlighting and memorialising this aspect of our history. It is intended to create debate and discussion around the 'Architecture of Containment' which prevailed within this state. People are still living with the consequences of all this history. Privately run, yet publicly funded institutions, still exist when we look at Ireland’s current system of Direct Provision. Conall Ó Fátharta is a Senior News Reporter with the Irish Examiner. His special area of interest has been the treatment of women and children in Ireland. His journalism has been instrumental in highlighting church and state collusion. According to Conall, unmarried and vulnerable women, and children, were treated in a ‘sprawling network of interlinking institutions, private agencies and state authorities’. Rather than separate ‘scandals’ there is one big scandal. Prof. Eoin O’Sullivan is a Professor in Social Policy at Trinity College. He is the foremost expert in Ireland in the area of Industrial Schools, and was the consultant to the RTE documentary series States of Fear. Eoin is the author of the books Suffer the Little Children and Coercive Confinement in Ireland. Mike Milotte has been writing about adoption malpractice in Ireland since the 1990s. His book Banished Babies, highlighted an international ‘baby market’ where Ireland was a supplier of babies. His research highlighted the infrastructure that was in place with respect to the export of babies to the USA and other countries. He also highlighted a parallel ‘black market’ that existed in Ireland, whereby documents were falsified to facilitate illegal adoptions. Mike is of the view that almost all adoptions in Ireland were non-consensual i.e. forced. Liam O'Mahony is an accredited Psychotherapist and Addiction Counsellor with over nine years of experience working with adults and adolescents. He is associated with the Centre for Self-Leadership Internal Family Systems Therapy (IFS), a member of the Irish Association for Counselling and Psychotherapy (IACP) and Addiction Counsellors of Ireland (ACI). He is a graduate of University College Cork and Cork Institute of Technology, with a particular expertise in areas such as Trauma and Addiction. Mary Slattery is a Mother, who lost her first born to a forced, secretive and closed adoption system through St Anne’s Adoption Society Cork. Mary is a member of ‘Know my Own’ group since 2003. She is passionate about the injustice of the forced adoption system. Mary addressed the Joint Oireachtas Committee on Health and Children on the heads of the Adoption (Information and Tracing) Bill 2015. Terri Harrison was marched home from Britain by the Catholic Crusaders in 1973, because she was single and pregnant. Back in Ireland, she escaped from Bessborough Mother and Baby Home, only to be brought to St Patrick’s Mother and Baby Home on the Navan Road. In St Patrick’s, she was denied pain relief in labour and medical care after giving birth to Niall, before nuns took him away, never to be seen again. This event will be held in the Rory Gallagher Theatre at 7.00pm. This is a free event, but advance booking is advised.